The Muslim Brotherhood in Egypt has been accused of destroying 47 Christian churches, monasteries, schools and hospitals in a violent rampage through the capital. Many people have been killed or injured in the recent clashes which have reverberated around the world. On Saturday this week the Coptic Orthodox Dioceses of Sydney and Melbourne will hold simultaneous ecumenical services for people of all denominations and faiths to pray for the victims of sectarian violence in Cairo yesterday when more than 278 lost their lives, and for Egypt’s Christians whose lives are in increasing danger. Yesterday as the world focussed its attention on the events unfolding in Cairo, the members of the Muslim Brotherhood went on a 12-hour rampage against Christians in cities and towns across Egypt. More than 47 of the nation’s churches were destroyed along with monasteries, convents, community centres, Bible Society offices. 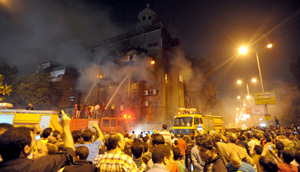 In addition Members of the Brotherhood attacked nuns, assaulted priests, kidnapped a pastor and his wife and set fire to 17 Coptic homes, destroyed Coptic-owned pharmacies, hotels and businesses and bookshops. Bishop Anba Suriel, Australia’s highest ranking Coptic cleric and leader of Australia’s 80,000 Coptic Christians says the community is in shock. “There is no doubt what occurred across Egypt yesterday was an organised and systematic attack against Egypt’s Coptic Christians that is unprecedented in the modern era,” Bishop Suriel says. Egypt’s Copts who trace their origins to the days of the Pharaohs and their faith back to 50 AD, and the earliest days of Christianity, have suffered increasing persecution from Islamic extremists over the past few years. Yesterday’s simultaneous attacks by Muslim Brotherhood supporters of outsted President Mohammed Morsi however are unparalleled in recent times both in the range and extent of the attacks as well as the ferocity of the destruction. The violence that erupted in Cairo yesterday when Egypt’s interim Government called in security forces and the army to remove two encampments of Muslim Brotherhood protesters, resulting in the deaths of 278 with thousands injured has received wide media coverage. But the simultaneous and obviously planned destruction of churches and Christian institutions as well as attacks, assaults and kidnaps on Egypt’s Christians have been largely ignored by Western media, Bishop Suriel says. This morning the Foreign Minister Bob Carr called for restraint by Egypt’s interim government and the Muslim Brotherhood pro-Morsi supporters and issued a travel warning, yet he failed to mention or even acknowledge the destruction wrought by the Brotherhood against Egypt’s Christians and the Copts in particular. “Once again we are calling on the Foreign Minister to use Australia’s position as a member of the United Nations Security Council to raise awareness of what is happening to Egypt’s Coptic community and Egypt’s Christians,” Bishop Suriel says. He believes it is vital the world is aware not only of the plight of Egypt’s Christians but of the danger posed by the Muslim Brotherhood to Egypt as well as other countries, including Australia. “There are definitely members of the Muslim Brotherhood in Australia and we should not forget this is an organisation that not only has links to terrorist groups such as Jamaar Islamiah and Islamic extremism, but was banned for decades in Egypt as a terrorist organisation,” he says. Bishop Suriel says what is seldom reported in the West is the fact that when in power Morsi and his Muslim Brotherhood-backed Government not only began to create what they hoped would eventually be an Islamic state, but appointed known terrorists to high-ranking positions in the Government. “There was outrage as well as alarm throughout Egypt when the appointment was announced and made Morsi and the Brotherhood’s intentions clear,” Bishop Suriel says. Morsi was removed from office in June this year after a series of peaceful demonstrations and a petition signed by more than 33 million Egyptians, he says pointing out this number was many times the number of those who voted for the Muslim Brotherhood-backed president 12 months before and included the vast majority of Egypt’s moderate Muslims and the millions who had fought for democracy and freedom during the so-called Arab spring. The millions who wanted Morsi to stand down became alarmed when he wrote Sharia law into Egypt’s constitution and troubled as it became clear he was determined to impose Sunni ideology on the entire population, and to eventually create an Islamic state under strict Sharia law. Banned as a terrorist organisation in Egypt during deposed President Hosni Mubarak’s rule, the Muslim Brotherhood not only continues its strong links with terrorist group Jemaah Islamiah and has also forged strong ties with al-Qaeda with al-Qaeda distinctive black flag now flying above many of the nation’s destroyed churches. This has been fuelled by al-Qaeda’s Egyptian leader, Ayman Zawahiri who accused Coptic Pope Tawadros II last week of conducting a “Crusade” to overthrow Morsi and the Muslim Brotherhood and claimed the leader of the world’s Copts intended to create a Coptic state in Egypt. Although the oldest ethnic group in Egypt, the Copts make up just 10 percent of Egypt’s 80 million population, and under Church teaching, dedicated to peace, the idea of Coptic overthrow should be greeted with incredulity. Instead it is being used to further inflame Islamic extremism and incite further attacks on Coptic Christians. Portrayed by Muslim Brotherhood as the instigator in Morsi’s overthrow, Pope Tawadros has received numerous death threats and is at risk of assassination. “The Brotherhood has made serious threats against his life and His Holiness has been forced to live in seclusion at his residence where he is unable to leave. Filthy language and graffiti has also been scrawled across the outside walls of the residence,” Bishop Suriel says and adds that it is important the West understand that whatever the Muslim Brotherhood may claim, democracy is not a priority. When Morsi was finally forced to stand down in June this year, Bishop Suriel wrote to the Foreign Minister Bob Carr after the Minister gave a television interview saying that Western leaders were deeply disappointed that President Morsi had been forced to step down and that the first democratically elected government in Egypt had failed. Concerned Australia’s Foreign Minister was out of touch with the situation in Egypt, and having just returned from Egypt himself, the leader of Australia’s Coptic Christians documented the threat posed by Morsi and the Muslim Brotherhood and the plight of Egypt’s Copts and Christian communities. Today, deeply saddened by what is happening in Egypt and at the high number of deaths and injuries that occurred in Cairo last night along with the simultaneous violence against Christians across the nation, Bishop Suriel asks Christians across Australia to pray for peace and to pray for his homeland. Bishop Suriel prays peace will return immediately to Egypt. “Violence is never an answer. In Egypt there must be communication and reconciliation with all parties sitting around a table,” he says and insists the Muslim Brotherhood must also be part of this.